Kerry 3-6 Mayo 2-6 (Croke Park, 15/2/1948). 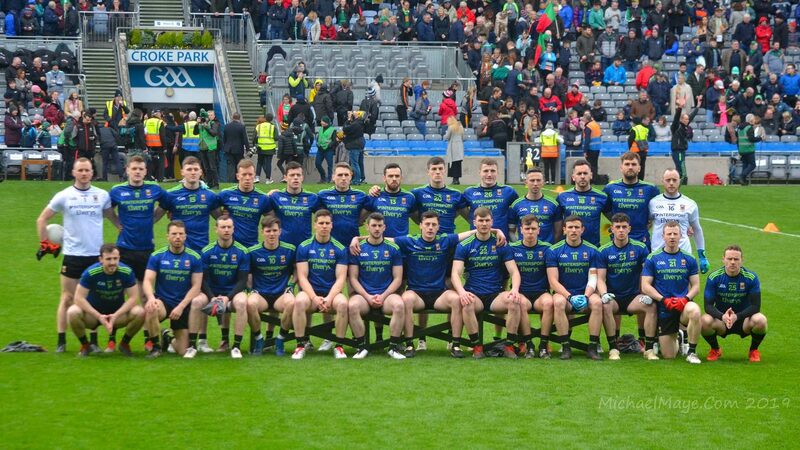 MAYO: T Byrne; P Gilvarry, P McNamara, T Quinn; S Flanagan, J Forde, John Gilvarry; E Mongey (1-1), P Carney (0-2, two frees); S Daly (0-1), T Langan, L Hastings (0-1), J Munnelly, P Solan (1-1), T Acton. FIRST ROUND: Mayo 4-9 Leitrim 1-2 (Sligo, 13/6/1948). MAYO: T Byrne; P Quinn, P Prendergast, S Flanagan; J Forde, P McAndrew, John Gilvarry; P Carney (0-4, two frees), E Mongey; W Kenny (1-3), T Langan, L Hastings; S Daly (1-1), P Solan (1-0), S Mulderrig (1-1). SEMI-FINAL: Sligo 1-5 Mayo 4-2 (Sligo, 27/6/1948). MAYO: T Byrne; P McNamara, P Prendergast, S Flanagan; J Forde, P McAndrew, P Quinn; E Mongey, P Carney (0-1); W Kenny, T Langan, S Hastings; S Daly (0-1), P Solan (3-1), S Mulderrig. FINAL: Galway 1-7 Mayo 2-4 (St Coman’s Park, Roscommon, 18/7/1948). MAYO: T Byrne; P Quinn, P Prendergast, S Flanagan; J Forde, P McAndrew, John Gilvarry; E Mongey, P Carney; W Kenny, T Langan (1-0), L Hastings; S Daly (0-1), P Solan (1-0), S Mulderrig (0-3, two frees). Subs: Joe Gilvarry for W Kenny, W Kenny for L Hastings. FINAL (REPLAY): Mayo 2-10 Galway 2-7, after extra-time (St Coman’s Park, Roscommon, 1/8/1948). MAYO: T Byrne; P Quinn, P Prendergast, S Flanagan; J Forde, J McAndrew, John Gilvarry; E Mongey, P Carney (0-9, six frees); W Kenny, T Langan, Joe Gilvarry; S Mellotte, P Solan (1-1), S Mulderrig (0-1). Subs: P McNamara for McAndrew, T Acton for Mellotte. SEMI-FINAL: Mayo 0-13 Kerry 0-3 (Croke Park, 29/8/1948). MAYO: T Byrne; P Quinn, P Prendergast, S Flanagan; J Forde, P McAndrew, John Gilvarry; E Mongey, P Carney (0-1, free); W Kenny (0-2), T Langan (0-3), Joe Gilvarry (0-1); T Acton (0-1), P Solan (0-3), S Mulderrig (0-1). (One Mayo point unaccounted for). FINAL: Cavan 4-5 Mayo 4-4 (Croke Park, 26/9/1948). MAYO: T Byrne; P Quinn, P Prendergast, S Flanagan; J Forde, P McAndrew, John Gilvarry; E Mongey (0-1), P Carney (1-2, penalty goal and a free); W Kenny, T Langan, Joe Gilvarry; T Acton (2-0), P Solan (1-0), S Mulderrig (0-1). Galway 1-3 Mayo 1-11 (Tuam, 17/10/1948). MAYO: T Byrne; J Forde, P McNamara, S Flanagan; E Mongey, P McAndrew, John Gilvarry; H Dixon, P Carney (1-6, three frees and a ’50’); W Kenny (0-1), M Flanagan, Joe Gilvarry; T Acton (0-2), P Solan (0-1), S Mulderrig. Sub: L Hastings (0-1). Mayo 4-6 Kerry 0-3 (MacHale Park, 21/11/1948). MAYO: T Byrne; P Gilvarry, P Prendergast, John Gilvarry; E Mongey, P McAndrew, S Mulderrig; P Carney (0-5, three frees), H Dixon (0-1); W Kenny, T Langan (1-0), L Hastings; T Acton, P Solan (2-0), M Flanagan (1-0).